Members of Parliament have quizzed State House officials over the Shs5 billion donations made by President Museveni to residents of Rukungiri District at the weekend. However, the Presidential Committee of Parliament on Wednesday tasked State House officials led by State Minister for Planning and Monitoring in the Office of the President Kasirivu Atwooki and State House Comptroller Lucy Nakyobe to explain where the President picked such a huge sum of money from. “The 1,000 boda bodas, 25 lorries, seven tractors, 20 minibuses and a lot of money given out to SACCOs; we are wondering whether this one was in the State House budget,” said Amuria Woman MP Suzan Amero. Ms Amero, who is also the committee vice chairperson, explained that whereas the President has a right to make donations, they should have a criteria and spread out across the country so as not to appear sectarian. The MPs also accused the President of using the donations to rally Rukungiri residents ahead of the May 2 by-election for the Woman Member of Parliament.The Court of Appeal on March 22 rendered invalid NRM’s Winnie Matsiko’s win as Rukungiri Woman MP after her challenger, Forum for Democratic Change’ s Betty Bamukwasa Muzanira petitioned against her victory. In response, the State House officials said the number of items were donated by the President was inflated by the media and promised to avail the committee with details of the donated items. “I am surprised that the press that was on ground in Rukungiri and interviewed us relayed different information. I can imagine 1,000 motorcycles can fill up this Parliament; the tractors were only two, we shall provide the information to the committee,” said Ms Nakyobe. Ms Nakyobe also explained that the money was from the State House budget under donations. Rukungiri District is home to Opposition leader Dr Kizza Besigye, and voted against Mr Museveni in both the 2011 and 2016 elections, and returned more opposition MPs in the 2016 elections. 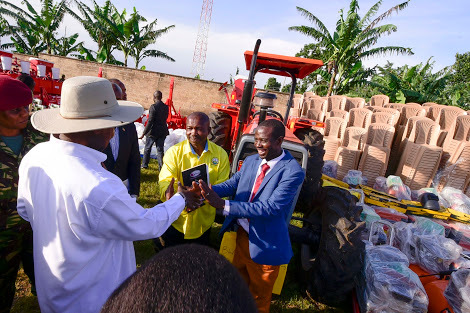 While delivering the donations on Sunday in Rukungiri Stadium, in the backyard of Dr Besigye’s country home, Mr Museveni complained against especially the youth for joining the FDC en-masse. “I have taken this money from my pocket as President. There is a lot of money in your government but you don’t know how to get it. The young people have been caught up in FDC which is deceiving them,” he. 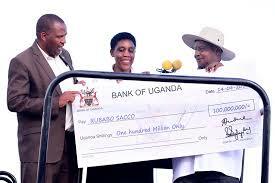 Mr Museveni then went on to directly campaign for the ousted NRM candidate in the upcoming elections beseeching his beneficiaries not to be confused.